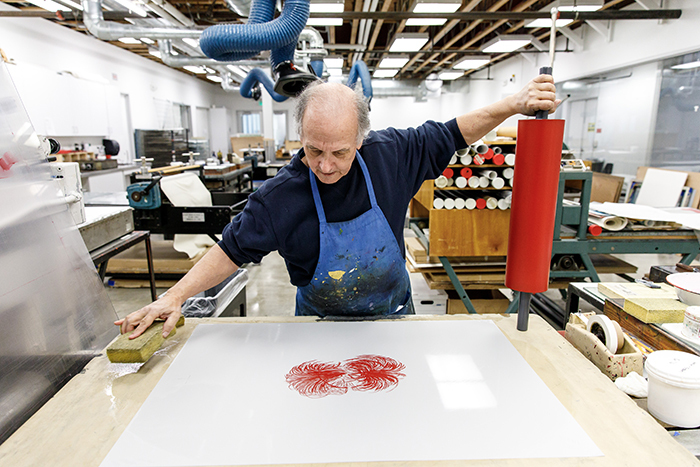 Part 2 of the exhibition A Living Treasure: Thirty Years of Anthony Zepeda and the ArtCenter Printmaking Studio opens at the Hutto-Patterson Exhibition Hall in the 870 building at South Campus on Tuesday, May 22, from 7:30–9 p.m. The evening will open with a “Public Discussion with Tony Zepeda” led by Fine Art Chair Laura Cooper followed by a reception celebrating Tony and the incredible work produced by ArtCenter students over the last thirty years. Part 2 of this collaborative exhibition between the Fine Art and Illustration departments will feature a new offering of prints produced by students over the last thirty years from the ArtCenter Printmaking Studio from a variety of majors, as well as new work—presented here for the first time—by ArtCenter faculty Tony Zepeda . It will be supplemented by photographs from Tony’s years as a printmaker with Gemini, where he worked with some of the most historically significant artists of the twentieth century, including Jasper Johns and Robert Rauschenberg. This entirely new exhibit replaces the previous exhibition in order to celebrate the astonishingly large body of exceptional work produced by ArtCenter students over the lifetime of the Studio. The exhibition runs through August 20, 2018.